Barbados has long been considered a leader in the Caribbean both for the Tourism market and as a preferred destination for International Businesses. The marrying of these two sectors has created an extremely lucrative real estate segment for the local economy including Sales, Long and Short Term Rentals and Real Estate Management. The island has been gifted with a fantastic warm climate, stunning beaches and crystal clear sea; but the greatest gift this island has to offer is the friendly smile and charming personality of the Barbadian people. These factors combined have for many years made Barbados the first choice of discerning travelers from all over the world. The tradition of social and political stability as well as the excellent infrastructure have influenced purchasers to see the island as a great investment. The trend in Barbados real estate speaks for itself – over the last three decades values have continued to rise steadily and this movement is expected to continue well into the future. The Barbados real estate product is wide and varied – probably the most sought after spots are beachfront locations on the Platinum Coast (the West Coast) of the island. Real estate values on the West Coast of Barbados have soared recently due to the completion of the fantastic Sandy Lane Hotel; the development of such projects as Villas On The Beach, Schooner Bay and The Sands; and the truly spectacular villas on the coast. It is definitely the place to be and to be seen. Resort developments on the island have become an increasingly popular option for purchase – they offer gated communities, varied communal facilities (swimming pool, gym, bars, restaurants and marinas), as well as unique investment opportunities. Developments such as Royal Westmoreland with its Robert Trent Jones Jr. championship golf course; the Tennis Village located at Sugar Hill, a David Lloyd Resort Community; and Port St. Charles with its spectacular residential marina development, are but a few examples of the high quality communities available on the island. 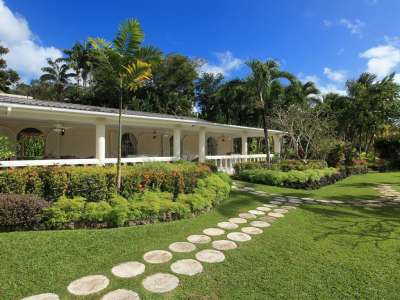 Many purchasers have begun to turn towards the Barbadian countryside. With limited land available for purchase on the seaside, traditional Barbadian plantation houses and country villas have become increasingly sought after. If you are considering the purchase of a Barbados real estate, not only can you look forward to appreciating values, you can also put your real estate onto the short-term rental market to be let to holiday-makers when you are not in residence.  As a formality, a non-national must acquire permission from the Central Bank of Barbados.  The Barbados real estate vendor is liable to pay a Property Transfer Tax of 2.5% of the purchase price.  Although funding can be secured in Barbados through an Offshore Loan, it is advisable for non-national purchasers to obtain funding externally as rates will be more attractive.  Funds brought into the island must be registered with the Central Bank in order to guarantee the repatriation should you decided to sell your investment.  It is advisable to employ the services of an attorney-at-law and a reputable Barbados realtor to handle these transactions. Legal fees are approximately 2% of the purchase price.  The Land Tax Valuation Department revises improved real estate valuations every three years and Land Tax is payable every year based upon this value. Most foreign owners of Barbados real estate have local managing agents to handle the day-to-day running and up keep of the villas, the management of the staff, and for the payment of all relevant government taxes etc. They ensure that the villa is run smoothly and is always ready for the arrival of guests or owners. Direct Flights - British Airways and Virgin Holidays fly direct to Barbados from Gatwick. British Midlands offers direct service from Manchester, and charter flights are provided by Thomson Holidays. BWIA operates connections from Heathrow. Barbados is a mere eight hours away from London. Hospitality - Barbadians are incredibly friendly people and welcome visitors into local bars, restaurants, clubs and festivals. It is said that we are down to earth, self-confident and always ready to oblige. Our island is very safe and tourists can relax knowing that if they get lost, a wide smile and some helpful advice will always be just an introduction away. Festivals - At any time of the year, there is almost certainly a festival to be found. The most celebrated festival is Crop-Over, historically celebrating the end of the sugar cane harvest. Beginning in the middle of July, Crop-Over lasts for three weeks, with parades, music and costumes taking centre stage. The final carnival takes place on Kadooment Day, the first Monday in August. The Jazz Festival, Holder's Season, Oistins Fish Festival and Gospelfest are also big events. Food - The Bajan food is a reflection of the wide variety of peoples we have welcomed into our land. An intriguing mixture of Polynesian, French, Greek, Chinese, Italian, Japanese and New World are all available. Fine restaurants populate the island, or you can try our famous Fish Fry Friday evenings complete with dancing and entertainment for the whole family. Beach barbeques, fast-food outlets, and local fare share the spotlight as well. Nightlife - It's hardly surprising that such a friendly people have a vibrant nightlife scene! From the camaraderie of the sports enthusiasts to the cultural shows for families to the youthful club scene, Barbados offers entertainment until the wee hours. Many clubs offer all-inclusive cover prices for drinks, entry and food, while others have Happy Hour available. Accommodation - The Caribbean's highest class resorts are situated on our sunny shores. The island also offers apartments, intimate villas, all-inclusives and budget hotels, catering to all tastes and traveling styles. You can find a hotel complete with a spa and golf course, or choose an apartment with a kitchen and have an excuse to shop in our produce markets. Beaches - The lively beach culture of Barbados has a long history. The locals love to spend time on these long stretches of peach sand just as much as our visitors! The west and south coasts are relatively calm, since they face the protected Caribbean Sea. On the eastern shores, the wild Atlantic sends up frothy blasts as waves crash against the exposed coastline. International surfing and windsurfing competitions have taken annual advantage of these conditions for years. Activities - If sports are your activity of choice, you'll have no end of options on our island. World class facilities and frequent sporting festivals will provide something for everyone. Hotels also offer a number of water activities, or golf and tennis. These can be arranged with the activity desk. If you're feeling in the mood for getting off the beaten track, try a safari, hiking, snorkeling with our gentle sea turtles, or horseback riding. If you'd rather watch, then try an afternoon on the east coast at one of the world's most distinguished surfing competitions. Sporting festivals include the Celtic Festival (Rugby), Festival Cricket, the Polo Season, and the Gold Cup Festival. History - Barbados has a long colonial history unique among the islands of the Caribbean. The British ruled here for almost 350 years. Historical sites and monuments such as plantation Great Houses, and sugar mills offer tours for the interested visitor. The island can also claim the oldest parliament of the Western Hemisphere at an astonishing 375 years old. We became an independent land in 1966. Weather - Out of the Caribbean hurricane path, Barbados is home to temperate year-round temperatures of 28 to 30 degrees C. As the most easterly of the Caribbean islands, the trade winds blowing off of the Atlantic provide a constant gentle breeze. Countries: The Caribbean Sea region contains two major chains of islands: the Greater Antilles (which comprise almost 90 per cent of the region’s total land area) and the Lesser Antilles (made up of the Leeward Islands in the north and the Windward Islands in the south). The Caribbean islands extend almost 4,000km (2,500mi) in a wide arc from the Bahamas 100km (60mi) off the east coast of Florida to Trinidad 24km (15mi) off the coast of Venezuela. Most of the major islands are independent countries, although retaining close ties with their former colonial rulers, and some remain colonies or dependent territories of Britain, France, the Netherlands or the USA. The countries which attract most foreign real estate buyers include those listed below. Population: The populations of the Caribbean countries most favoured by foreign home buyers are: Antigua & Barbuda (77,000), Bahamas (285,000), Barbados (260,000), Bermuda (60,000), Cayman Islands (33,000), Dominica (75,000), Guadeloupe (350,000), Jamaica (2.4 million), Martinique (345,000), Montserrat (13,000), Puerto Rico (3.6 million), St. Christopher (St. Kitts) & Nevis (45,000), St. Lucia (150,000), St. Vincent & The Grenadines (115,000), Trinidad & Tobago (1.25 million), the Turks & Caicos Islands (10,000), the British Virgin Islands (13,000) and the US Virgin Islands (117,000). The majority of inhabitants are of African descent, their ancestors having been shipped to the Caribbean as slaves and indentured servants. Some islands also have a large Indian population whose forebears were brought to the Caribbean as indentured labourers by the British. The population of many islands swells considerably in the winter, when many visitors stay for the whole season. Foreign Community: There’s a significant foreign community in most of the Caribbean islands, mainly consisting of British and American retirees, and expatriate workers engaged in the financial services and tourist industries. Many visitors spend up to half the year in the Caribbean. Area: The areas of the most popular countries among foreign home buyers are: Antigua & Barbuda (442km2/179mi2), the Bahamas (13,938km2/5,382mi2), Barbados (430km2/166mi2), Bermuda (53km2/20mi2), Cayman Islands (259km2/100mi2), Dominica (748km2/289mi2), Guadeloupe (1,710km2/66mi2), Jamaica (10,990km2/ 4,243mi2), Martinique (1,100km2/425mi2), Montserrat (102km2/39mi2), Puerto Rico (8,897km2/3,435mi2), St. Christopher & Nevis (360km2/139mi2), St. Lucia (622km2/ 240mi2), St. Vincent & The Grenadines (388km2/150mi2), Trinidad & Tobago (5,130km2/1,981mi2), Turks & Caicos Islands (430km2/166mi2), British Virgin Islands (153km2/59mi2) and the US Virgin Islands (340km2/130mi2). Geography: The Caribbean islands comprise a total land area of 234,000km2 (90,350mi2) and with the exception of the Bahamas lie between latitude 10º north and the Tropic of Cancer (23º27’ north). There are literally thousands of tropical islands and cays (the Bahamas alone comprises some 700), the vast majority of which are tiny and uninhabited. The islands are noted for their dazzling, white sandy beaches (some of the finest in the world) and fine coral reefs, warm clear seas, lush vegetation and exotic flora and fauna (rainforests, tropical plants and flowers), mountains, rivers and waterfalls, and cloudless blue skies. Some islands have live volcanoes, including Guadeloupe, Martinique, St. Vincent and Montserrat, which was devastated in 1997 when its Soufriere Hills volcano erupted, spewing ash and lava over half the island and burying the capital Plymouth. Climate: The Caribbean islands enjoy a tropical or sub-tropical (in the northern Bahamas) climate, which is one of the healthiest in the world, with 3,000 hours (some 300 days) of sunshine a year. However, the climate differs considerably between the islands as a result of their different topography. In most islands, daytime temperatures rarely drop below 16ºC/61ºF or rise above 32ºC/90ºF and the average annual temperature is around 25ºC/77ºF. In winter the weather is usually pleasant with temperatures between around 18 to 25ºC/64 to 77ºF. The difference between the highest and lowest temperature varies throughout the year by just 3ºC/5.5ºF in the southern Antilles to 6ºC/11ºF in the Bahamas. Average sea temperatures range from around 28ºC/82ºF in the warmest months to 25ºC/77ºF in the coolest (in the sub-tropical Bahamas the temperature is a few degrees lower). Many islands experience high humidity, particularly during the summer months, although the heat is tempered by cooling trade winds. Annual rainfall varies considerably, but in most islands is between 1m and 1.5m (39 to 59in), with the wettest months between May and November and the driest from December to April, although on some islands rainfall is more or less constant throughout the year. The region is susceptible to violent storms and hurricanes between June and November, and most islands experience severe tropical storms around every ten years (hurricanes less frequently). During the northern hemisphere’s winter, the Caribbean is the world’s cruise centre. Language: The official language is English (or American), French, Dutch or Spanish, depending on an island’s former (or current) colonial allegiance. On the majority of islands the official language is English, while many also have their own colloquial languages such as Creole and Papiamento, the patois spoken in the former British possessions. Political Stability: Political stability varies according to the island, but is generally good to excellent. Many islands are colonies or dependent territories (by choice) and are therefore very stable. Most ex-British colonies have a system of government based on the British parliamentary model. Some governments have been involved in corruption scandals in recent years, although this is the exception. Currency: Various, many of which are tied to the US$ at a fixed exchange rate. Some islands share a currency, such as the Eastern Caribbean dollar (EC$). US$ banknotes and travellers’ cheques are widely accepted (the US$ is the de facto currency in the Caribbean) and the US$ is the official currency on some islands. Many islands are popular tax havens, particularly the Bahamas and the Cayman Islands. Exchange Controls: None on most islands, although some have limited restrictions. On some islands, the export of local currency is subject to severe restrictions and sometimes totally prohibited. Some islands require foreign currency to be declared on entry and exit, and only imported currency can be exported. Interest Rate: 5.75 per cent (Bahamas). Cost/Standard of Living: The cost of food and essential services is reasonably low on most islands, although imported goods (including most consumer durables) are expensive. Cars, clothing and appliances are comparatively expensive, while items such as jewellery, perfumes and alcohol are generally inexpensive. The cost of living is similar to most western European countries, but higher than the USA and Canada. Income Tax: There’s no income tax on many Caribbean islands and where there is, it’s relatively low. Retired foreign nationals may be exempt from paying income tax on income earned abroad. Capital Gains Tax (CGT): Most Caribbean countries have no capital gains tax. Inheritance & Gift Tax: None. Value Added Tax (VAT): A few islands have a value added or sales tax, e.g. 15 per cent in Trinidad and Tobago. The main source of income for most governments is import duties, which are levied on most imported goods. Some islands have special taxes, such as a tax on hotel bills. Market: There’s a buoyant market in luxury homes on most islands, although prices are comparatively high. Beach front properties are in particularly high demand. Many new homes are built mostly of wood and older wooden cottages are also available on many islands. Detached homes usually have their own swimming pools. New developments usually provide a wide range of amenities which may include restaurants, bars, shops, tennis courts, swimming pools, water sports facilities, private beaches, boat docks and on-site management offices. Most developers provide a management and letting service. Cost: Homes on most islands are expensive on account of the high cost of land and because most building materials and fixtures and fitting must be imported. On the most popular islands, apartments start at around US$300,000 and detached villas at US$500,000, although cheaper Barbados real estate is available on some islands. Barbados real estate is cheaper on the smaller, less developed islands, although these are generally for those seeking almost complete solitude. Prices have risen considerably in the last decade and beach front properties are prohibitively expensive on many islands. Most new developments comprise luxury condominiums (apartments) or luxury detached homes. Prices are usually quoted in US$. Local Mortgages: Mortgages are available from local banks on most islands. Maximum loans are usually 50 to 60 per cent on second homes with repayment over a maximum of 15 years. A small duty may be imposed on mortgages. Loans are available in the local currency or US$, which usually offers a lower interest rate. Lenders generally insist that properties are insured for their full value and borrowers may also require life insurance. real estate Taxes: Barbados real estate taxes are levied on most islands and are based on the market or rentable value. Taxes are usually low, e.g. in the Bahamas they’re 1 per cent of the market value up to B$500,000 and 2 per cent of the market value above B$500,000 for non-residents (taxes are slightly lower for permanent residents). There may be an annual fee for refuse collection. Purchase Procedure: It’s usual to retain a local lawyer to complete the formalities. Foreign buyers may require police clearance from their country of residence and must usually produce evidence of their funds. The purchase procedure on most islands is based on the British model (see page 150). Most islands have an efficient and safe legal system and problems are rare. Fees: Most countries levy duty and/or transfer tax on real estate purchases at between 5 and 10 per cent, e.g. 7 per cent on properties costing over B$100,000 in the Bahamas and 10 per cent in Antigua/Barbuda and Barbados. Estate agents’ fees are usually between 5 and 10 per cent for developed Barbados real estate. Legal (conveyance) fees are usually 2.5 to 3 per cent of the sale price. Precautions: Before buying building land, you must ensure that you have planning permission (or that it will be approved) for the size and type of property you plan to build, and that services will be provided. In view of the occasional severe storms (and erupting volcanoes!) it’s important that a home is insured for the full cost of rebuilding. Restrictions on Foreign Ownership: Official government permission is usually required for foreigners to purchase real estate, although this is a formality and may be required only for properties above a certain land area, e.g. 2 hectares (5 acres) in the Bahamas. The amount of land that can be purchased for residential purposes without a permit is usually limited to between 1 and 5 acres. Building Standards: Generally excellent for new properties. The quality of older properties is variable. Homes are usually built in the local style employing local materials (e.g. wood) whenever possible. Personal Effects: Can be freely imported without any restrictions, although duty is payable on some large items (such as motor vehicles) and can be high. In some cases, items of high value such as photographic equipment, portable computers, electronics apparatus and sports equipment must be declared. Crime Rate: Low on most islands, although crime has risen considerably on many islands in recent years and you should always keep an eye on your belongings. Violent and serious crime is relatively low, but increasing. Some areas on some islands are to avoided, particularly at night. Organised crimes such as drug trafficking and money laundering are a problem on some islands. Medical Facilities: Good on most islands, although some facilities aren’t available on the smaller islands. In the less developed islands, you will need to be flown out as soon as possible if you fall seriously ill. Private international health insurance is highly recommended, as the best hospitals are often private and it may be necessary to be evacuated to the USA or a neighbouring country to be treated for certain serious health problems (which must be covered by your insurance). Pets: There’s no quarantine for pets on most islands, but check before buying a home. All animals require a current vaccination certificate including rabies. Residence Permits: Usually a formality, provided you have adequate means of financial support and own a Barbados real estate (or have made an investment) above a certain minimum amount, e.g. B$250,000 in the Bahamas. In most cases a temporary (e.g. annual) or permanent residence certificate must be obtained, for which there are high fees, e.g. up to B$10,000 in the Bahamas. On some islands the fee for a residence certificate is based on the value of your Barbados real estate, e.g. 5 per cent of a property’s value in Antigua and Barbuda. Note that some islands also levy high fees for those wishing to become tax residents. Citizenship based on investment is also available on some islands. Work Permits: Difficult to obtain unless you plan to start a business and create employment, when there are minimum levels of investment. Employers must usually show that there isn’t a similarly qualified local resident available to fill a position.